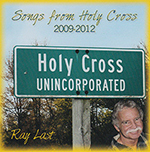 ‘Songs from Holy Cross’ 2009-2012. Recorded March 2013 This double CD has 32 songs including many originals and contemporary worship. I recorded this with only my vocal and guitar in a somewhat ‘raw’ form. All 32 songs were recorded in just 3&1/2 hours.